Learning, writing, birds, otters, details, and soul. A reblogged post. In my college writing class I assign “The Pigeon Paper.” This is a short expository essay written to address a one-word topic—write about “squash” or write about “salt”—a paper completed in ten days. The first year it was about pigeons—hence the name. We began the assignment by brainstorming what we knew individually about pigeons and considering different structures for an expository paper (comparison, chronology, description); overnight each of us researched and the next day we brought in research and each proposed three potential topics and approaches; then we had a few days to complete a draft for peer editing in class, and a final draft of the paper was handed in the following day. After perusing my tattered because well-loved go-to resource for poetry, The Norton Anthology of Poetry, 4th Edition, and considering many candidates for a final National Poetry Month set of phrases, I decided on a sample from Ohio-born poet Kenneth Koch (1925-2002). His work is often funny, satirical, off beat, and tongue in cheek. The sample I’ve chosen shares these qualities through Koch’s use and discussion of the nature of language. Heavily influenced by surrealism and modernism, the poetry of the New York School was serious but also ironic, and incorporated an urban sensibility into much of the work. Kenneth Koch’s grammatical poem “Permanently” sounds a bit like a Mad Libs story, with some blanks filled in, others waiting to be. At the same time, there’s a deliberate mismatch between parts of speech and their labels–for instance, “Adjective” and “Sentence” each represent a noun in grammatical context. In this sense, Koch’s piece could be seen as a parody of the formulaic, color-by-numbers travesty of linguistic creativity that is the Mad Libs word game, as if it’s a cheap thrill at the expense of the English language. My words, not his. Not that I actually hold that opinion (I refrain from deciding today), but Koch may have viewed things in similar terms. Or, "Will you please close the window, Andrew?" Satire, whether in art or writing, uses the tools of parody, irony, randomness, nonsense, odd juxtapositions, and other devices to create absurdities that mock and criticize, as a way of dethroning the powerful, rooting out hypocrites, and exposing the flaws of its targets. Note the irony of the statement before the excerpt’s first example, given the complexity of that example. Also ironically, the poem has no obvious adverbs, though its title is one. What other satirical tools do you see at work in the sample? The poem has a more serious ending, turning to love, and the whole is well worth the read. Among those collections that house the full poem “Permanently,” Permanently, Tiber Press, 1960, must surely be one. However, Amazon.com lists the book as currently out of print with limited availability. To learn more about Kenneth Koch and other New York School poets, visit these dedicated poetry resources. Note: Koch’s Wikipedia page is annotated as flawed, and I often find sites like Poemhunter, Poetrysoup, and other unofficial databases to be half baked and unreliable. I never direct my students to these less reputable resources, though I’ll use them in a pinch to get a gist. Final thought: Check out the pictures from his later years; Kenneth Koch looks remarkably similar to Bernie Sanders, don’t you think? Very different New York “schools” . . . . Koch would have had a field day with today’s presidential candidates. There are at least two literary programs in April that I recommend exploring. “Inaugurated by the Academy of American Poets in 1996, National Poetry Month, held every April, is the largest literary celebration in the world with schools, publishers, libraries, booksellers, and poets celebrating poetry’s vital place in our culture. “Poem-A-Day,” which shares original, previously unpublished poems by contemporary American poets. Note that this is an unofficial promotion involving no transaction or official partnership/sponsorship with Poets.org. “April is National Poetry Month” from ReadWriteThink.org – Their partners include the International Literacy Association, the National Council of Teachers of English (NCTE), and Verizon Foundation. “Celebrate National Poetry Month” from Scholastic.com, which also features “Dear Poet: A Unit Plan for National Poetry Month” for teachers. “National Poetry Month” from ReadingRockets.org (“Launching young readers!”) – They have a ton of resources! They are funded by the Corporation for Public Broadcasting and partner with dozens of national education organizations. Check your local library or university for other upcoming National Poetry Month events such as readings and contests. I will be popping in and out here at Philosofishal with poetry-related notes and possibly some poems throughout the month. II. The other literary event in April I’m highlighting is Camp NaNoWriMo, a slightly more casual National Novel Writing Month that happens in April and July. Follow them on Twitter @NaNoWriMo for kick-off and wrap-up messages, participant discussions, pep talks, updates, and more. 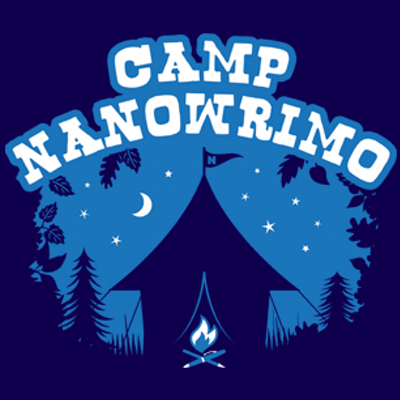 Look for the Camp NaNoWriMo logo and learn more at their About page. Note that this is an unofficial promotion involving no transaction or official partnership/sponsorship with Camp NaNoWriMo. I have signed up and will be participating by writing memoir as I spend time with extended family over the Easter holiday. So get out there and be literary in April and beyond! Enjoy. Days Without Writing. Another artist who may turn out to have helped save me from Ivory Tower prison . . . whether I decide to ascend the stairs or not. Definitely a kindred spirit, a blogger worth following.